Bastille are heading to the Yorkshire coast this summer for what promises to be a stunning night at Scarborough Open Air Theatre. The chart-topping and multi-award-winning band behind such anthems as ‘Pompeii’, ‘Good Grief’, ‘Laura Palmer’ and ‘Things We Lost In The Fire’ will play Europe’s largest open-air theatre on Saturday July 28. It is just seven years since South Londoner Dan Smith started Bastille alone in his bedroom. With Chris Wood (drums), Will Farquarson (guitar) and Kyle Simmons (keyboards) added to the line-up, Bastille have become a global phenomenon. The band’s chart-conquering debut album ‘Bad Blood’ sold more than four million copies alongside 11 million singles. In the UK, the twice Number One album was certified double-platinum and earned Bastille the British Breakthrough award at the 2014 Brits, along with two Grammy nominations. The 2016 follow up ‘Wild World’ – spearheaded by single, ‘Good Grief’ – topped the UK album charts and hit Top 5 in the US. Featuring the singles ‘Send Them Off!’ ‘Blame’ and ‘Glory’ it was a hit with fans and critics alike and saw them scoop NME Album Of The Year. Together with a series of sold out arena tours and major festival appearances, Bastille have also collaborated with acts like Haim, Kate Tempest and Angel Haze, and Dan co-founded and co-runs an indie label, Best Laid Plans, helping to develop acts like Rag ’N’ Bone Man and Rationale. Bastille join a stellar 2018 line-up at Scarborough OAT that includes Britney Spears, Lionel Richie, Il Divo, Gary Barlow, The Script, Steps and Alfie Boe. 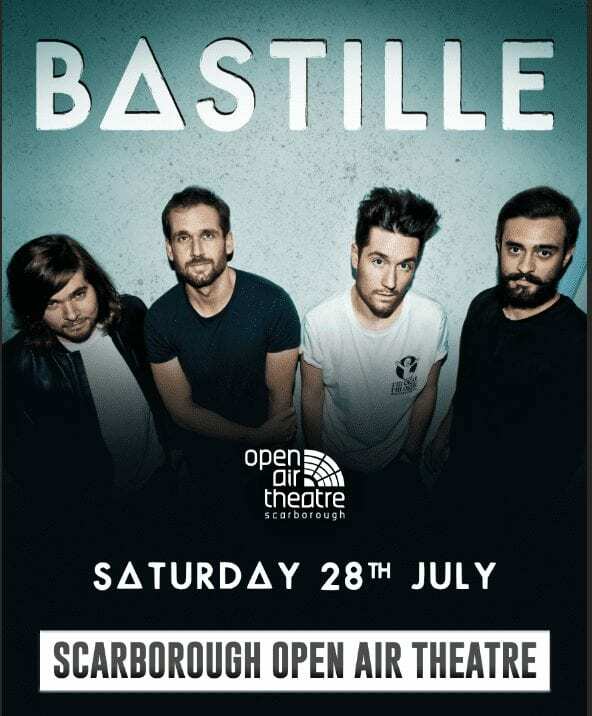 Tickets for Bastille’s Scarborough Open Air Theatre show go on sale at 9am on Friday February 9 via www.ticketmaster.co.uk and www.scarboroughopenairtheatre.com or in person from Scarborough Open Air Theatre Box Office (01723 818111) and the Discover Yorkshire Coast Tourism Bureau (01723 383636).